Let's start things off by going through some IDP news, notes, and commentary from Week 8 of the NFL season. Broncos SS Duke Ihenacho was forced from Sunday's game against the Redskins with an ankle injury. He was seen in a walking boot the following morning. He will take the bye week to recover and we will re-evaluate his status come Week 10. Vikings SS Jamarca Sanford exited Sunday night's game against the Packers in the first quarter with a groin injury and did not return. Mistral Raymond replaced him in the starting lineup. Bengals MLB Rey Maualuga was forced from Sunday's Week 8 game against the Jets with an MCL injury and a concussion. The MCL injury will cost him 4 weeks. Michael Boley will take his place on the weak side likely until at least after the Bengals' Week 12 bye. Despite putting in a full practice on Wednesday and limited practices on Thursday and Friday, Packers linebacker Brad Jones was inactive for Sunday Night's game against the Vikings. His hamstring injury has turned into a multi-week absence and may affect his play moving forward for the next few weeks. 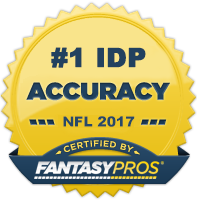 IDP studs Wes Woodyard and Bobby Wagner both returned to action in Week 8, each producing mediocre fantasy stat lines. Tyrann Mathieu was once again back to playing every down with Rashad Johnson only seeing 63% of the team's snaps against the Falcons. The Honey Badger's play on Sunday was quite good as he racked up 7 tackles and an INT to go along with 2 pass deflections. There's still a chance he sees his snap counts reduced in certain weeks, but he's been too consistent to not start at this point. The Giants completely changed up their defense against the Eagles this week and sat both Ryan Mundy and Spencer Paysinger. Neither player played a single snap on defense. I'm not sure if this trend will continue, but get both players out of your lineup until we see something change or until we get confirmation it was only a one week thing. Jason Pierre-Paul told reporters this week that he wouldn't be at full strength until next year. He's another one of the thought-to-be DL studs coming into the year that I will be dropping down my Rest of Season Rankings later in the week. Rookie Baccari Rambo, who was on my waiver wire recommendations last week, came through for owners with 9 tackles (while only playing 69% of the snaps). However, don't get your hopes up. He will likely be heading back to the bench this week as Brandon Meriweather returns from suspension. Daryl Sharpton is the most likely replacement for the injured Brian Cushing. He has a good chance to play every down, but both he and Joe Mays (also an every down possibility) have been too inconsistent throughout their careers for me to trust them as anything more than LB4+s for the time being. Now onto The Guru's IDP waiver wire selections for Week 9! DE/LB Quinton Coples (NYJ) - Similar to Matt Shaughnessy last week, Coples makes the column because he's an outside rush linebacker who qualifies in many leagues as a defensive end. He's under the radar right now as he missed a large portion of the first 6 games. However, he's back at full strength now and playing 75-80% of the snaps. With that snap volume, he's a sneaky DL3-DL3+ play rest of season. RDT Vance Walker (OAK) - For those in DT-required leagues, give Walker a look. He's coming off of back to back solid games (5-0-1 and 4-0-1, respectively) and is seeing 50-60 snaps a game out of the same position that made Desmond Bryant a viable fantasy option in Oakland the last few seasons. DT2+. RDE Ropati Pitoitua (TEN) - Pitoitua is a player I included on my waiver wire recommendations earlier in the season. He's still unowned in the majority of IDP fantasy leagues and has a very nice matchup against Kellen Clemons and the Rams who are currently giving up the 5th most fantasy points to defensive linemen. I expect a couple solos and a sack this week out of him. SLB James Anderson/MLB Jon Bostic (CHI) - I mentioned Anderson and Bostic in last week's article last week, so I won't harp on them too much here. I just wanted to remind everyone that Lance Briggs is out roughly 6 weeks and consequently Bostic and Anderson will likely play every down and both see a good bump in value. LILB Craig Robertson (CLE) - I've written in the forums and within the post comments at fairly good length about the digression of D'Qwell Jackson's play over the last few weeks. Although the stat line this week was good for him, his on-the-field play was still mediocre and he was outshined by Robertson in several regards. With 3 sacks and 30 total tackles in his last 4 games, Robertson is making a case that he deserves to be in the same fantasy tier as the declining Jackson. I don't know if I fully agree with that over the long haul, but for the time being, I can't argue. SLB Dont'a Hightower (NE) - Hightower is playing nearly every down and has put up 21 total tackles and a sack in the two games since Jerod Mayo went down with a season-ending injury. I was a bit skeptical after his first big performance, but it's now time to take notice. Both he and Brandon Spikes are worth rostering. They will likely alternate top performances depending on the matchup (use Spikes in run-heavy matchups and Hightower more against spread offenses). LILB David Hawthorne (NO) - Hawthorne busted onto the IDP scene back in 2009 when he had 85 solo tackles, 3 INTs, and 3 sacks in a shortened season. He's been fairly disappointing since as he's missed a lot of time due to injury. He started this season in similar fashion, however over this last three games he has 20 tackles, 2 sacks, and a forced fumble. He has a top 10 matchup against the run-heavy Jets this week making up a solid LB4. The Saints limit their own defensive tackle opportunity too much to rank him much higher, but he can still prove useful for those in a bye week/injury pinch. SS D.J. Swearinger (HOU) - It was initially reported that Shiloh Keo would take over for the injured veteran Danieal Manning; however, it was Swearinger that started and saw the lion's share of snaps at strong safety. With Brian Cushing now done for the year, Swearinger has the skill-set and opportunity to put up DB3+/DB2- numbers much like fellow rookies Jonathan Cyprien and Kenny Vaccaro. For those in deeper leagues, he's worth a speculative add. For all others, keep a close eye on his production this week and get ready to pounce if he shows up in the box scores. FS Chris Conte (CHI) - Conte isn't setting the world on fire with his production, but at a position were consistency is at a premium, he's worth a look. He's had 6 solo tackles in four of his last five games and with multiple injuries along the Bears front seven, his opportunity should only increase. You could do worse as your DB3 in deeper, tackle-heavy leagues. SS Antrel Rolle (NYG) - Rolle is likely owned in the majority of leagues at this point in the season. I put him on the list for those in shallower leagues, however. In an attempt to shore of up their leaky defense, the Giants have been changing up their base defensive looks and Rolle has been one of the main beneficiaries. He was moved to strong safety three weeks ago and it's shown in his numbers (19 total tackles, INT, FF, Sack, 4 PDs in that span). Expect DB2-DB2+ numbers from here on out unless the Giants change things again defensively. SS Troy Polamalu (PIT) - Polamalu has never been a big tackle-producing safety for owners. However, when healthy he typically finds a way to be productive and be a viable DB3 in a lot of weeks. If there was a week to start him, it would be this week. As the strong safety, he will be responsible for covering "Gronk" on Sunday and should see plenty of balls thrown his way. This could very well be his best tackle performance of the season.